GlovEye is enabling blind and partially sighted people to read books, by translating printed text into Braille. We’ve developed a special portable glove which has a Braille cell under the index finger, that can project any character as Braille to the user's fingertip. It’s connected to our reader app via Bluetooth and can be used on smart devices with cameras. Today in the United States 50% of blind children drop out of school and 70% of blind people are unemployed. A big part of the problem is that only around 10% of blind people are able to read Braille, and less than 1% of the world’s literature is available in Braille. 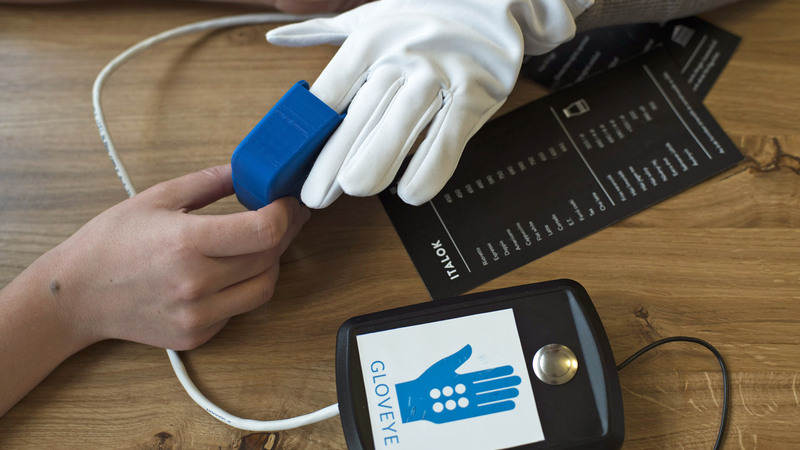 GlovEye not only translates written content into Braille but also features a talkback function which allows users to learn Braille “on the fly”. Our product has been designed to be affordable, because cost shouldn’t be a barrier for those who want to read. Provide the ability to read to tens of thousands of blind and partially sighted people, while fighting to improve Braille literacy. We expect to make reading accessible to 34,000 blind people within the first 5 years, but with nearly 300 million people affected by visual impairment, it’s a huge market that has serious growth potential. Our team are a group of passionate and hard-working software development students who love to code in their spare time! Having an interest in innovative solutions and staying up to date with the latest advancements in technology makes it an exciting space to work in! Who knows what will be possible in the future, but hopefully with GlovEye we can continue to improve the lives of blind and partially sighted people further.